Having the best 24-inch monitor you can afford is an absolute must, whether you’re into gaming or simply watching the latest movies in 1080p or 4k resolution. 1080p monitors (monitors that feature a 1920×1080 resolution) are very common today and at 24″ produce nice, sharp images. Above that size, say at 27″, 1080p loses its resolution a bit because the pixel density is lower. But anything from 24” down, you should be in great shape with 1080p. 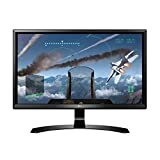 The AW2518HF from Alienware is an active-matrix TFT LCD monitor with 1920×1080 resolution. It’s been designed from the ground up for game enthusiasts. The monitor works perfectly with AMD’s FreeSync technology but misses the boat unfortunately with no support for Nvidia’s G-Sync. The Alienware 25 will synchronize your GPU and monitor so it displays full frames only when the monitor is actually capable of displaying them. Graphics distortions like tearing or artifacts forming on the screen will be totally eliminated and you’ll experience native refresh rates and tear-free, rapid-fire graphics that don’t require any adjustments while you’re trying to play. With the AW2518HF you’ll also experience responsive gameplay with lightning-fast 240 Hz native refresh rate along with 1ms response time to deliver smooth gameplay with almost no input lag. The AW2518HF is compatible with all operating systems and has a solid brightness rating of 400 nits. It’s built with premium materials and is easy to adjust. An epic silver and black chrome finish complete the monitor to make it the perfect addition for your ecosystem. 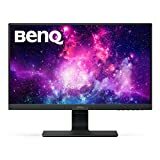 The BenQ Zowie XL2540 is a full HD (1080p) monitor G-Sync and FreeSync capability. It also features a native 240 Hz refresh rate to provide gamers with an excellent gaming experience. A built-in black equalizer increases your visibility while watching dark scenes without overexposing the bright areas and creating washout. Many times, different usage requires unique display settings. With the exclusive BenQ Zowie S-Switch, you’ll have easy access to settings and switching between any of the modes you’ve saved. With 20 different levels of color vibrancy, you’ll have the flexibility you need to get the exact color performance you want. Any specific viewing requirements and preferences are available for all types of gameplay. The exclusive adjustable angle and removable Tactical Shield allows you to adapt your play to various environments and remove specific distractions by preference. You can stay concentrated and focused on winning the game you’re playing. BenQ Zowie’s height adjustable stand can be easily operated with the touch of a single finger. You can adjust the height of the monitor to your exact viewing angle to maximize your comfort and playing area. 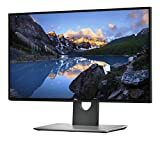 Dell U2518D offers 2560 X 1440 maximum resolution at 60 Hz in a 16:9 aspect ratio. Pixel pitch is .216mm x .216mm and up to 1000: 1 contrast ratio. 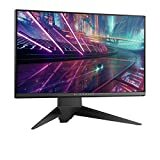 The monitor sells in a lower price range than many of the others in this review and may not be suitable for extensive gaming use as it does not offer G-Sync or Free Sync technology. Gamers may, therefore, experience some graphics distortions like tearing or artifacts forming on the screen. This can be especially troublesome with the Dell 60 Hz frame rate of this monitor or with rapid-fire graphics games. For non-game regular viewing, the U2518D should be quite adequate. It supports HDR content playback, a greater depth of colors than many competitors, remarkable clarity, and a high-contrast range of shades to create realistic images that will be strikingly brilliant. Even HDR photos will boast a lifelike experience due to the 2560 X 1440 resolution and high contrast ratio. Although the monitor offers good sRGB coverage with vivid, accurate and consistent shade representation, some reviewers consider the non-support for extended color spaces a problem. 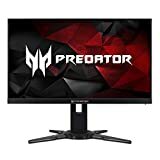 The Acer Predator XB252Q bmiprz is better than ever with a full 24.5-inch Widescreen HD display (1920×1080) featuring Nvidia’s G-Sync technology, an HDMI port, and a full 240 Hz refresh rate and a pixel pitch of 0.283 so gamers will have an excellent playing experience. Acer’s fast response time of 1ms and flicker-less technology reduces annoying screen flickering that can cause eye strain when viewing your monitor for extended periods of time. And the full HD resolution images will show you all the details you’ll need to make your gaming experience better than ever. The Acer Ergo Stand pivots, tilts, swivels, and moves up or down exactly the way you want so you’ll find the most comfortable viewing angle. And the VESA-compatible mounting offers a sleek, space-saving option when you need to place the monitor in a tight space. Acer’s top-quality built-in 2-watt speakers sound great and will bring world-class sound to all of your games and movies. High high-bandwidth connection ports like HDMI and DisplayPort assure you of the finest possible gaming experiences. Another top-notch monitor is the Asus ROG Swift PG258Q eSports gaming monitor. Like the Acer Predator above, it also delivers a full 25″ HD viewing experience of 1920x1080p, 1ms response time, and a native 240Hz refresh rate. NVidia G-Sync (up to 180 Hz) eliminates any screen-tearing to give you smooth gaming by synchronizing the PG258Q’s refresh rate and minimize display stutter. Ultra Low Motion Blur technology makes objects that are in motion look much sharper, while Asus eye Care technology reduces eyestrain with flicker-free backlighting and blue light filtering. The PG258Q’s astonishing 240Hz native refresh rate is double the normal rate of 120Hz for shooting, racing, sports, and real-time strategy and sports titles with never any break in the action. The monitor features a custom heat sink that’s twice the size of most others to make sure it stays cool during any marathon gaming sessions. Cooling is aided by a Smart Air Vent design that uses convection air currents to generate airflow inside the monitor. The handsome design is futuristic, featuring bold, strong lines and lighting effects on its stand to add additional ambiance to your gaming setup. The 24″ AOC Agon AG241QX is a blistering fast professional quality monitor designed for the avid gamer. 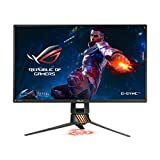 Compatible with Nvidia’s G-Sync technology, this excellent gaming monitor redraws the screen with a refresh rate of up to 144 times per second to give you ultra-smooth, brilliant images for an exceptionally low price. The AG241QX professional display also boasts 1ms response time for fast graphics rendering while Adaptive-Sync technology eliminates stuttering and tearing. You’ll enjoy an astounding 2560×1440 resolution, which is 4x what you’d see with regular 720p. And, the QuickSwitch controller lets you have fast, effortless access to up to three customized game modes. Connectivity is no problem as the AG241QX boasts an array of connections you’ll need for any gaming or entertainment needs. Multimedia Connections include VGA, Dual-Link DVI, HDMI 2.0, HDMI-MHL, and Display Port connections. You’ll also find 4 x USB 3.0 ports including one that’s fast-charging. For your audio experience, the AG241QX comes with two 3-watt speakers and an audio line-in/headphone out connection. With the MHL-enabled HDMI connection, you’re able to connect your smart device to your monitor and simultaneously charge and stream mobile multimedia. The monitor’s stand is sleek in design and fully adjustable to further enhance your viewing experience. The GW2480 is considered one of the best 24-inch IPS monitors on the market today. Not only does it have great specs but it’s handsome too with ultra-thin bezels and hidden cable management. The exclusive BenQ eye-care and low Blue light technologies offer you flicker-free performance for extended viewing comfort. Industry-leading brightness intelligence delivers exquisite visual details in any ambient lighting environment. The GW2418 monitors ambient light in your viewing environment and will actively adjust the screen brightness to give you the most comfortable viewing experience possible. You’ll enjoy a stunning full 16:9 HD display with immaculate image quality in 1920×1080 resolution and a refresh rate of 60Hz. The wide viewing angle offers you 178 degrees of viewing for clarity from any viewpoint. Meanwhile, Brightness Intelligence Technology adjusts the brightness according to ambient light conditions and on-screen content. The gracefully sculpted base profile eliminates any extraneous edges for a clean, functional, and appealing look. OS compatibility includes Windows 7, Windows 8, Windows 8.1, and Windows 10. 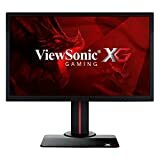 The ViewSonic XG2402 is a 24” full 1080p resolution HD monitor that’s packed with the speed and features that many of today’s diehard gaming enthusiasts are looking for. 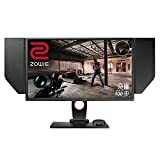 It features FreeSync technology, an incredible 144Hz refresh rate, VESA Adaptive-Sync Technology, and variable refresh rate capabilities to virtually eliminate screen tearing and stuttering. A blazing-fast 1ms response time and low input lag provide smooth screen performance even when you are viewing the most graphic-intense video sequences. The XG2402 maintains brilliantly rich colors and contrast. The ViewSonic Black Stabilization feature will provide you with heightened visibility and detail by brightening the darkest scenes. A ‘ColorX’ option will deliver the optimal refresh rate, response time, and color that’s ideal for your shooting games. In addition, three customizable ‘Gamer’ settings provide individual user preferences for specific games. Additional features include Eye Care Advanced Ergonomics, HDMI and DP settings for eSports, and X light. A fully adjustable ergonomic stand helps to deliver to you the comfort you need for every marathon gaming session. The gamer-inspired ergonomic stand features an integrated headphone hook in addition to cable management functionality to help you conquer every gaming and entertainment quest. The Samsung LC24F396FHNXZA provides you with a truly immersive viewing experience with its ultra-slim and sleek curved screen. You’ll enjoy stunning panoramic views from wherever you are, whether at work or play. The monitor’s design is inspired by the curvature of the human eye and delivers a comfortable and enjoyable viewing experience for your home or office use. The ultra-slim design measures less than 0.5inch thick yet with Samsung’s Active Crystal Color technology it delivers brilliant picture quality with vibrant and stunningly vivid colors. The excellent 3000:1 contrast ratio will deliver deep blacks and bright whites so you can clearly see even when you’re watching the darkest or brightest scenes. A stylish black body with a metallic finish and sleek curves along with AMD Free Sync technology and a fast 4ms response time allow you to see the fastest on-screen motion clearly and smoothly with less blur, judder, and ghosting. Samsung’s Eye Saver Mode optimizes your viewing comfort and the Eco-Saving Plus feature reduces screen brightness to save power, plus the screen brightness automatically transitions fluidly and reduces energy use even more. The LG 24UD58-B 4k UHD monitor allows you to play games, watch movies, or just read from your screen with stunning images at four times the resolution of standard full HD. The 24UD58-B works hard and plays hard with a host of gamer-friendly features such as free sync, Black stabilizer, and game mode. The breathtaking clarity and fine details of 4K UHD will amaze, even when viewed up close thanks to 8.3 million pixels on a screen with a resolution of 3840 x 2160. That’s four times the resolution of Full HD. And with FreeSync, gamers can experience seamless, fluid movement throughout their hi-res, fast-paced games. The sleek design of this LG premium monitor is accentuated by the new ArcLine stand. The smooth curve of the base provides stability, assuring dependable performance with a touch of elegance. 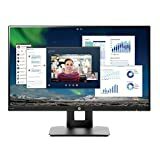 This budget-priced monitor features lots of expensive features along with tilt/height adjustment and built-in speakers in a minimalist design and fully-ergonomic functionality. The monitor’s best features are that it masquerades as a high-end offering with a bezel-free face. This makes it suitable for multi-screen setups. The HP VH240a has a built-in ergonomic stand that allows it to conveniently achieve a perfect view. The stand features tilt, swivel, pivot, and height adjustments to make it suitable for almost anyone. Resolution is 1920×1080 at a 60Hz refresh rate and 5ms response time. These specs aren’t as impressive as other cutting-edge monitors and make this model better for office display rather than gaming. However, for basic tasks such as document processing, browsing, movie watching or light gaming, it should be fine. There’s plenty of clarity since the pixel density is just enough to keep from looking grainy. The HP VH240a monitor is an excellent value for the price and looks clean and attractive for any environment. It can easily be mistaken as being worth twice its actual price with built-in features such as an ergonomic stand.